Poolside is the best supplier of Wisconsin swimming pool accessories, supplies, and products! We carry the industry’s most trusted brands of products so our customers get the best resources to keep their pool or hot tub running smooth and looking great. 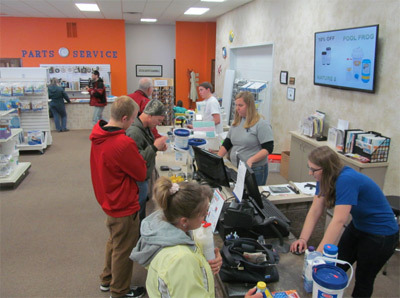 All of the chemicals necessary to maintain proper water chemistry in your pool or spa are always readily available at Poolside’s showroom located in North Prairie. Water chemistry is vital to maintaining the quality of your pool or spa: to make things easier, we offer free in-store water chemistry analysis so you have peace of mind that you’re swimming in safe waters. We offer our in-store services as well as our extensive swimming pool maintenance and spa maintenance services to ensure your investment runs properly all year round. Keeping your pool or spa debris-free all year round is a goal much more attainable with a professionally fitted, durable cover from Poolside. 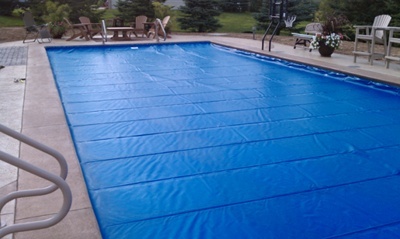 We keep both above ground (8 mm thick) and in ground (12 mm thick) blue pool solar covers in stock during peak pool season (no winter Wisconsin swimming for us). These solar covers act as a great retaining tool to capture the suns natural heat—and cut down on your heating expenses. Ordering a cover is as easy as taking a few measurements, sending in your order, and waiting the approximate three weeks for your cover to be made and shipped to us. The Infinity brand massage chairs add a therapeutic experience to your Wisconsin pool or spa. 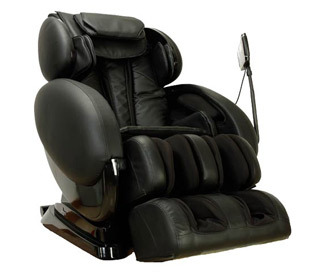 Customizable and targeted massage chairs use lumbar heat, body scan sensors, foot rollers, spinal compression and decompression for optimal comfort and use. Infinity Massage Chairs offered from Poolside deliver precise and accurate massage guaranteed to soothe stress and promote well-being (all while you relax by the pool). It’s not a Wisconsin summer pool party without a grill, get the most out of your grilling experience with Primo Ceramic Grills from Poolside. 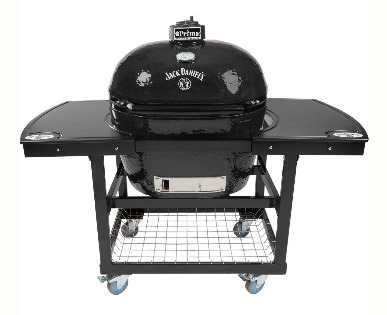 Backed by a 20-year guarantee, these grills provide years of delicious cookouts and satisfaction. Some of our grills have the space to sear 25 steaks at once--now that's a pool party. While proper water chemistry is the first stepping stone in keeping your pool crystal clear, having the proper filter on your pool is the next step. Poolside sells and equips all new pools with a sand filter system (size varies on the size of the pool). While sand is our filter media of choice, we also carry a wide variety of cartridge filter replacements, DE filter media, and Zeobrite filter media. Multiport ValveMultiport valves for pool filters usually have 6 settings: Filter, Backwash, Rinse, Waste, Recirculate, and Closed/Winter. The setting you use determines how to water goes through the pump, either being added back into the pool or out through the waste line. When your pool filter is first installed, Poolside technicians will gladly help you understand the differences in each setting so you always know which one to use. The main Filter setting is what runs water through the pump to be cleaned and will be the most used setting for many pool owners. The Closed/Winter setting is used when servicing the unit. It is essential to ensure your multiport filter is completely shut off before attempting to do any repairs or service on your own. The experts of Poolside will gladly help you safely work on your pool filter for clean water. Wisconsin pool owners are all too familiar with sudden weather changes that often come with living in the area. Don’t let these sudden temperature drops keep you out of your pool! Adding a gas or propane heater to your pool adds a new dimension to your swimming experience. No matter if it’s a scorching 105 degrees or a cool 72; keep your pool at a comfortable temperature, regardless of Mother Nature. Always hire a professional when your heat pump needs service, repairs, or replacement. One of the biggest mistakes made with heat pumps is leaving them exposed to water or debris. You should keep your heat pump where there is steady air flow and nothing which could block the system such as leaves. Otherwise, clogs might occur which could cause your heat pump to break. When your pool heater just doesn’t seem to be cutting it anymore, it can be difficult to troubleshoot the source of the problem. Maybe the heater isn’t working at all or maybe it’s just being slow. The Poolside team is experienced with different heater types and will help with repairs or replacement parts. If you believe there is a problem with your pool heater or heat pump, contact Poolside today for expert assistance you won’t find anywhere else. Poolside’s selection is not limited to the items above. We have an extensive supply of pool and spa products available including: hoses, ladders, pool toys, spa pillows and fragrances to enhance your pool/spa time fun. Vacuum your pool once a week to once a month, depending on how often the pool is used. Leaving your pool uncovered or being located near sand will require more vacuuming. Poolside offers you a dependable swimming pool service to take care of everything from vacuuming to balancing the chemicals in your water. Pool vacuums are a special vacuum head attached to a long pole and a special hose. The hose will have two ends, one with a swivel head and one without. It is the swivel head end which will need to be attached to the vacuum head. The other end will be used to fill the hose with water by being held against one of the pool’s water jets. You will know the hose is ready once bubbles come out of the vacuum end. 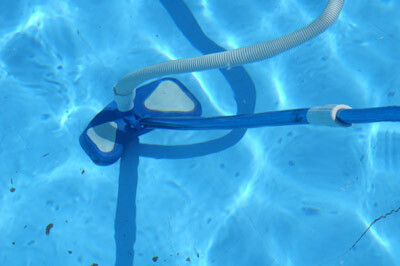 Remove the end of the hose from the water jet and attach it to the vacuum attachment on your skimmer or pool filter. If you have a multivalve filter, it will have to be set to waste so the vacuumed debris will not end up back in the pool. Begin to vacuum like you would with a regular vacuum cleaner using the pole attached to the hose and vacuum head. Be careful to keep the vacuum head as flat as possible against the bottom of your pool to avoid sucking up too much water. Empty the strainer as needed. If your pool has not been cleaned in some time, you might have to empty the strainer more often to avoid clogs. Whether you need pool supplies to keep your pool in perfect shape or want something fun, Poolside has what you need! A full line of replacement parts are available to keep your pool or spa running smoothly and efficiently! Last but not least, don’t jump in the pool without a pair of goggles and trusty floaties! 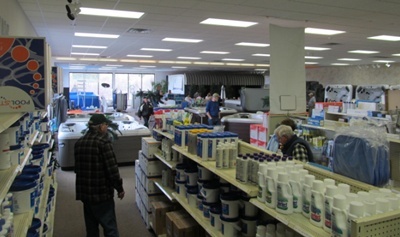 Contact the Wisconsin swimming pool specialists for all your pool supply and accessory needs.